If anyone knows a guy who lives in or around Newmarket with a black Pontiac Solstice bought through "New Roads," please let that person know that this is not OK. I cannot imagine there being more than a couple of these. I guess it was Sunday and there weren't many cars so this isn't really a huge deal but its amazing someone managed to park like this and thought "Yeah, this is good. I am definitely good with this." Last edited by Anikiri on Apr 10th, 2018 11:14 am, edited 3 times in total. That's why I park far to avoid drivers like this. 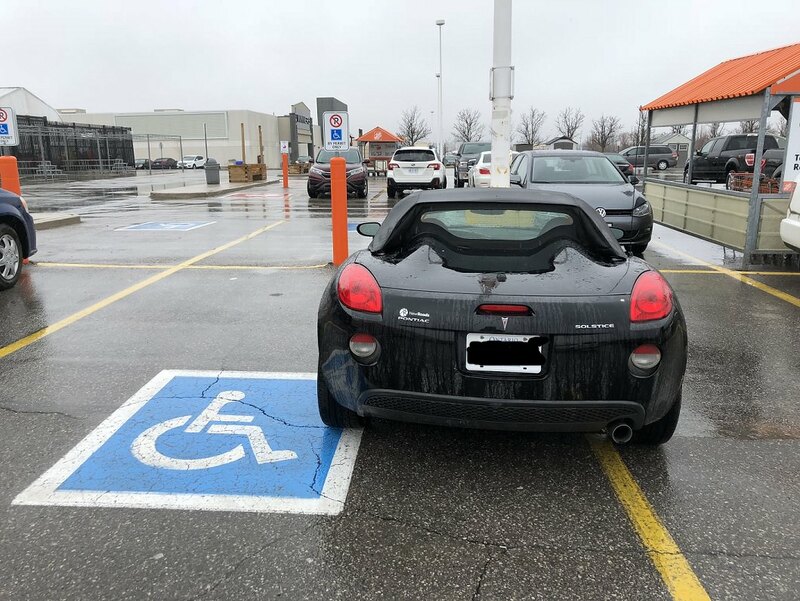 The driver deserves a handicap permit. Why need to block out the plates????? The sad thing, is the store doesn't give two shits to enforce it. I thought we dont that on RFD so we dont act like a mob. Last edited by Anikiri on Apr 10th, 2018 11:57 am, edited 1 time in total. what # should we call for parking enforcement if we see this car like this again? It's private property, I think if the store doesn't do anything about it... no one else really can. we don't need to call ... just place a bunch of shopping carts surrounding the offending car ... like this. That's a monthly occurance at one particular Costco here in Ottawa...I love it! A mob? RFD? You got to be kidding! You don't see blocked out plates in the carcam thread. just trying to avoid the handicap sign, okay? Did you at least report it to the store?